I managed to knock another one of my furniture painting projects out already this week. I have had a few pieces of furniture clogging up the house for a little bit and it needs to get done. I am redoing my room and right now I have unmatching bedside tables, dressers etc. I decided to switch to just one big dresser and liked the quirky style of this one. Let me tell you it weighs a ton though! I picked it up for $25 from Goodwill and it was covered in deep scratches and chips from a cat. That's where the amazing chalk paint comes in. 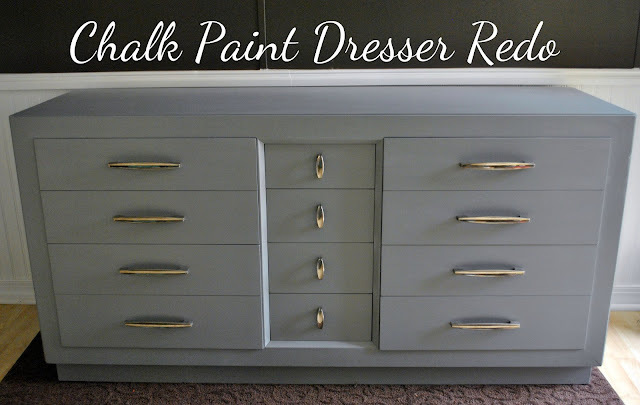 In case you missed it in my chalk paint vanity redo, I linked to a DIY chalk paint recipe there. Basically, I make four equal marks on a big measuring cup, fill it to the first line with Plaster of Paris, mix with a tad of water until it is the consistency of pancake batter and then fill to the top line with paint. 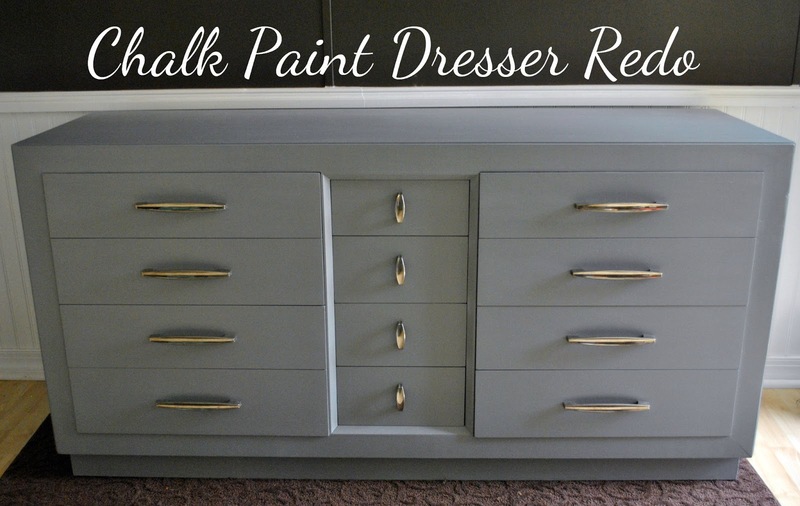 Mix it all together and you have awesome chalk paint that doesn't require sanding or priming. For this project, I had to sand down the piece pretty well because of the scratches, I also had to use wood putty to fill in some gouges in the wood. I used an oops paint grey color that I picked up from Lowes for $7 and painted on two coats of chalk paint. You use hardly any paint with this recipe. I literally used not even a fourth of a gallon for this piece. After two coats of paint, I put on two coats of paste furniture wax and buffed it out. I left the hardware as it was, because I kind of like the look. My original thought was to do some distressing, but I ended up deciding against it. I love it! It looks really great! :) How long did it take you? It took about 3 1/2 hours Beth because I had to do a good bit of sanding on it. Wow, You did a fantastic job. A big improvement. I usually gas myself with spray paint instead...lol. It's SO pretty! I need to start looking for thrift furniture. that is an unusual treatment! I really like the finished look but would love to see some different handles added to the redo as well. Great job!